It is a ship? No, it’s NEMO! What can you see at the NEMO Science Centre? 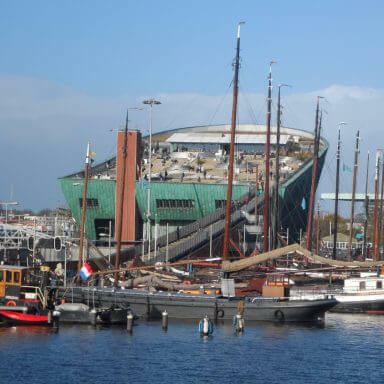 Right next to Centraal Station stands one of Amsterdam’s most futuristic-looking buildings – The NEMO Science Museum; in my opinion the perfect family day out. Children can involve themselves in experiments to learn more about chemistry, water, electricity, and many other common materials. Adult will (secretly) learn something, too. Everything can be touched, nobody will tell the children (or adults) to be quiet, and no-one needs to pay attention to a guide. In short, this is the perfect museum for kids! You can’t miss it; NEMO is shaped like a gigantic green ship and is clearly recognisable from a distance. It houses the largest scientific centre in the Netherlands. The museum is built on top of the foundations of the IJ tunnel and located at the Oosterdok. The building dates from 1997, is close to Amsterdam’s Centraal Station and was designed by the famous Italian architect Renzo Piano. According to Piano, Amsterdam had been a very one-dimensional city due to its skyline’s lack of height differences. Because of this, there was nowhere to look at the city from above. That is why he designed the Roof Square. From here you can admire the magnificent view over Amsterdam. The roof of NEMO boasts the highest city square in the Netherlands. I advise you to take the time to enjoy this. In addition to a beautiful view over the city, this is a wonderful place to relax after absorbing all that knowledge below. Anyone, not just ticket holders, can head up to the roof to enjoy the view over the city. Buy your NEMO tickets here. Avoid the queues and give yourself more roof-time! Many people think that the design for NEMO is inspired by a ship. That is not surprising because it is literally on the water and surrounded by (old) ships and the Maritime Museum. However, nothing could be less true because the design is actually inspired by the tunnel that runs underneath it. The building is a reflection of the IJ tunnel. This means that the building has the same curvature as the tunnel below, and where the tunnel is 10 metres deep, the building is 10 metres high. As far as I am concerned, the NEMO Science Centre is an excellent alternative to school education. You learn about the history of science in an exciting way. 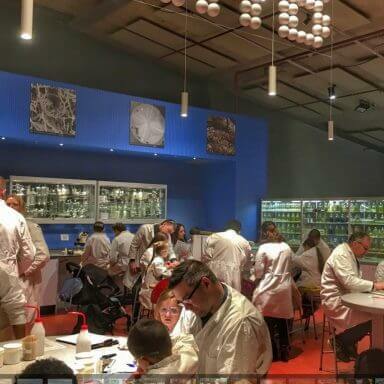 It is a great, highly interactive experience and allows you to do your own experiments in a real laboratory. In this museum you will be taught about subjects which include engineering, physics, chemistry and biology all at the same time! There are no boring classroom lessons here, but the opportunity to do, see, feel and experience. You will witness demonstrations and watch films, but you can also participate in interesting workshops and exciting experiments. In the Technium, on the second floor, you will find exhibitions based upon technical developments that have been of great influence within the Netherlands. Everything here is cool! We could hardly get the kids to leave! As soon as they enter the doors you’ve lost them and they’ll be doing those things they find interesting all afternoon, in a fun way. Why isn’t (primary) education one great big NEMO? You might have to wait a while to do a certain experiment, especially when NEMO is busy, but it is definitely worth the wait. 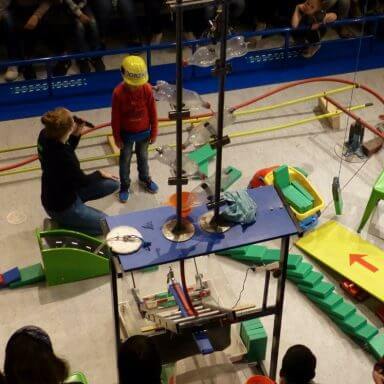 If you get the chance to visit, don’t miss the giant Rube Goldberg Machine! I’m not going to reveal too much about this, but believe me, it’s very impressive. You can also find out how lightning occurs, why the voices of men and women have different pitches and everything you will ever need to know about the colours of the rainbow. In addition to these, you will also learn about ‘normal’ phenomena such as light and sound, and make a journey through the human brain. In my view, one of the top attractions is the Lab. Children are given safety goggles and a white lab coat and immediately feel like real scientists. The staff let these mini-scientists do all kinds of experiments with products that we encounter every single day without knowing about their actual properties and characteristics. From what you have read so far, you might think that NEMO is more for children and young people, but that is simply not true. The museum is a fun and educational experience for both young and old. You can easily enjoy an entire day here. Take it from me; almost everyone will expand his or her world at NEMO. I have been here a number of times and always discover something new. As far as I am concerned, the NEMO Science Museum is an absolute must if you are in Amsterdam. Some call science boring but believe me, science is always fascinating at NEMO. As already mentioned NEMO is just a stone’s throw away from Centraal Station and is easily accessible by public transport. If you come to Amsterdam by train you can walk here in 15 minutes. This will make your day out less expensive and more healthy. Prefer to travel by bus? Take bus 22 or 48 and get off at the Kadijksplein stop. If you purchase a day pass you can explore the rest of Amsterdam by tram and/or bus for the rest of the day. I really do not advise a trip to NEMO by car. There is no customer parking and the parking facilities in the neighbourhood are expensive, even when you include the discounts offered to NEMO visitors at a few neighbouring parking garages. Been here with the kids. Love their reaction the whole time… even after we went back home! 654 visitors rated NEMO Science Museum average 4.94 stars out of 5.